The reality is that the Indian-Iranian relationship atrophied in the recent years in almost direct proportion to the rising US-Iranian tensions and is nowhere near its full potential. India once again has come under pressure from Washington to curb oil imports from Iran. However, mercifully, this time around the arms twisting is more like blackmail and in innuendos, which saves Delhi the embarrassment of being seen as subservient to US strategies toward Iran. According to an exclusive report by the Reuters, India may have to cut down its crude oil imports from Iran in the coming months by as much as two-thirds so as to keep the quantum of its half-yearly imports below the threshold prescribed by the US for India. It appears that sometime last month a “top US energy policy official” conveyed to Indian ministries that the quota allocated for Washington for the six-month period upto July entails that India should not import from Iran more than 195,000 bpd between January and July this year. Of course, if India doesn’t comply with Washington’s directive, that will trigger US sanctions. The Indian authorities have reportedly assured the American official that they will comply with the tolerance level prescribed by Washington. But then, Indian companies have already entered into contracts to import Iranian crude, which work out to an average of 322,000 bpd in the first quarter of the current year (January to March). This means that in the next quarter (April to June), India needs to cut its crude purchases from Iran to about 111,000 bpd so as to ensure that the ceiling prescribed by Washington – intake average of 195,000 – is not breached. This is notwithstanding the fact that Tehran is giving India a discount on crude and is offering free delivery. What emerges is that Delhi jumped the gun sometime toward the end of last year, blithely assuming that the US-Iranian engagement implied a more relaxed attitude in Washington toward India’s oil trade with Iran. It turned out to be bad political judgment, however. As President Barack Obama claimed recently the US intends to keep “95 percent” of the sanctions against Iran in place until a nuclear deal is concluded. Unsurprisingly, the US is extra-vigilant that in the interim the top buyers of Iranian oil such as India do not erode its sanctions regime. However, that’s not the whole story. As it happens, Delhi is also vulnerable at the moment to US pressure on the energy front. On the one hand, Delhi hopes to get on to a fast track in regard of sourcing LNG from the US (despite competing claims from Europe and Japan.) Again, Delhi is seeking access for Indian oil companies to the US’ upstream oil and gas sector, especially shale gas sector, where foreign investment is strictly regulated under American laws. One of India’s biggest companies, Reliance, has taken a 20 percent participatory interest in a shale gas asset in the US. The Reliance seems to pin hopes that through such participation, it can gain know-how about shale gas exploration and production, which in turn will enable it to get a jump-start in the Indian shale gas sector. Washington would know Reliance wields tremendous “bipartisan” political influence in Delhi and also about Reliance’s keenness to get access to shale gas extraction technology in which the US enjoys monopoly, so that it can take over India’s shale gas sector and the vast retail market in a near future. And, in the American political culture, there is nothing like free lunch. Suffice to say, the big question today is as regards the nature of the quid pro quo Washington would expect from India other than by curbing oil imports from Iran. Interestingly, a high-powered US-Indian “working group” on nuclear energy, which is co-chaired on the American side by none other than Energy Secretary Ernest Moniz, is meeting in Mumbai on Wednesday. The meeting will profoundly impact the future trajectory of US-Indian energy cooperation. Washington has ben pressing for a dilution of India’s stringent nuclear liability law to facilitate the American nuclear industry to sell reactors in the highly lucrative Indian market. 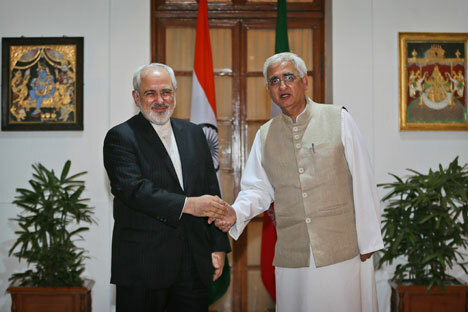 The official Indian line is that Delhi won’t allow the US to dictate the terms of its ties with Iran. But the reality is that the Indian-Iranian relationship atrophied in the recent years in almost direct proportion to the rising US-Iranian tensions and is nowhere near its full potential. In essence, the US is insisting that Delhi should not develop energy cooperation with Tehran unless and until a level playing field is available also for Big Oil in Iran’s energy industry. Indeed, Delhi is also at fault. It hasn’t taken pains to learn from smaller countries such as Turkey, Oman, Qatar, Iraq or Turkmenistan, which somehow are able to ignore the US’ sanctions against Iran and expand the vistas of their energy cooperation with Iran.